Like any good Roman-transplant, I spend a good deal of time happily scarfing down more pasta than I would have believed prudent 2 years ago. 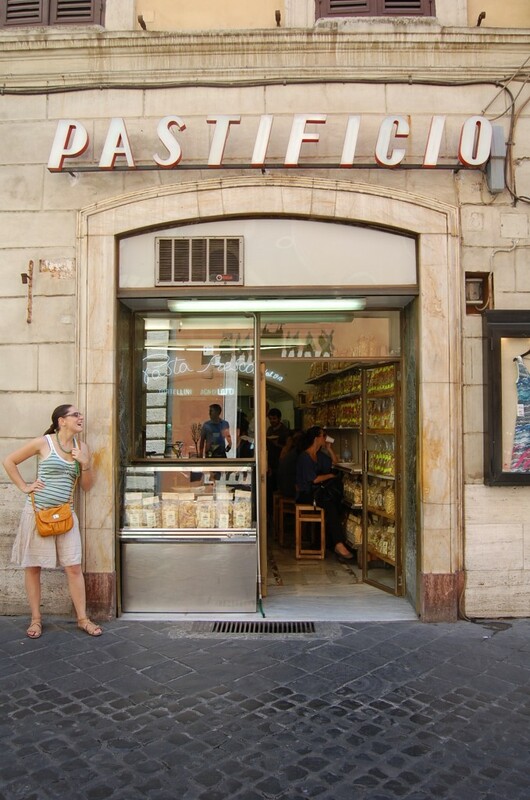 My hands down favorite place for a lunchtime carb fix in Rome’s historic center is Pastificio. 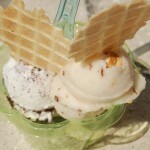 Not only is it very very good, it is also one of the cheapest places to eat near the Spanish Steps. Pastificio is 85% pasta shop and 15% delicious, serendipitous 4 euro lunch shop, should you be so lucky as to wander by at the right time. The shop is on one of the most exclusive streets leading up to Via Del Corso and I had heard about it for some time before I finally found it. What eventually tipped me off was a suspiciously long line leading out of a non-descript storefront I had wandered by countless times before. 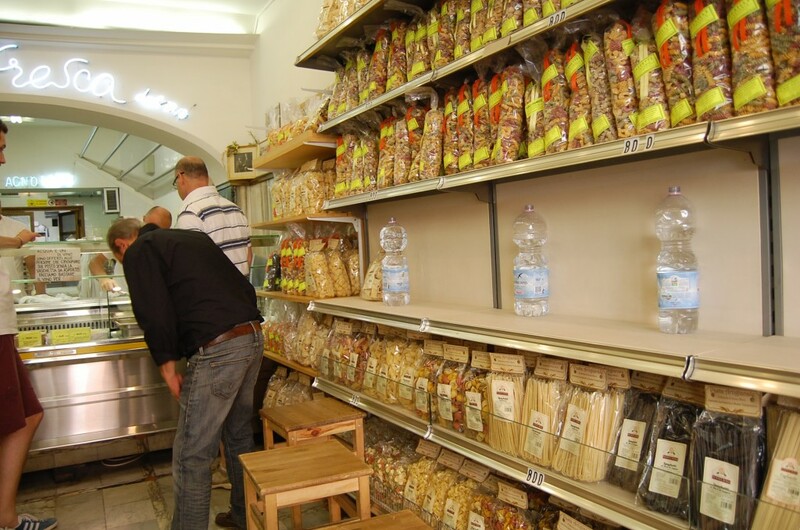 But each day, starting at 1 pm and going until 2:30ish pm (fellow bloggers, please correct me if I am wrong), Pastificio serves up hot pasta amid shelves of dried goodies you can take home for later. UPDATE: 1 pm to 9:30 pm, no stop! You get two choices every day. There’s usually a vegetarian option and a meat-lovers surprise. On this day, I went for the Amatriciana. Served on plastic plates, you have to order at the counter, and then squeeze into a spot on the slim ledges along either wall. 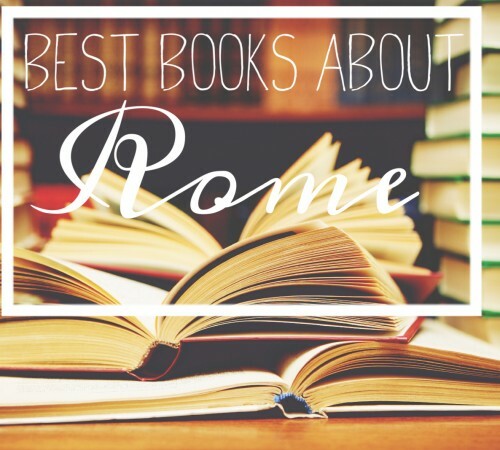 You can also ask for it to go and eat outside (but not in Piazza di Spagna). What makes it so good, in addition to fresh ingredients and an unbeatable price, is the free drink that comes with it. 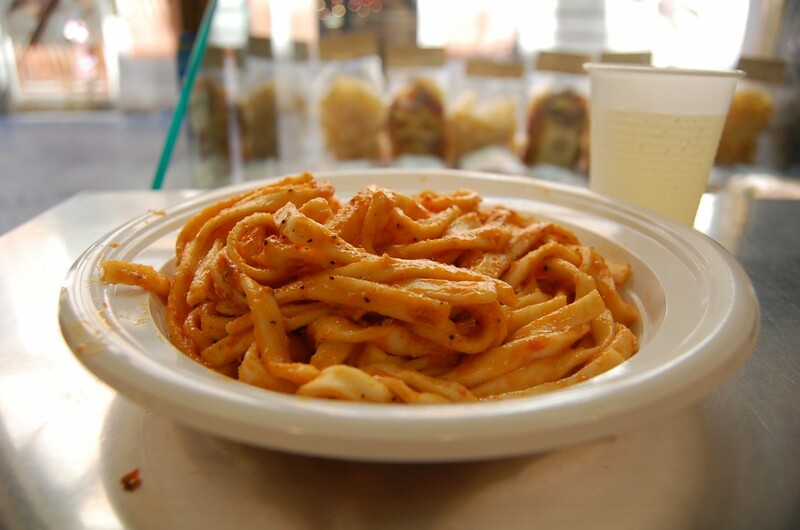 When you pick up your pasta, look for the jug near the cash register and the plastic cups. Pour yourself a glass of complementary house wine, or help yourself to the water that is offered through out the seating areas. 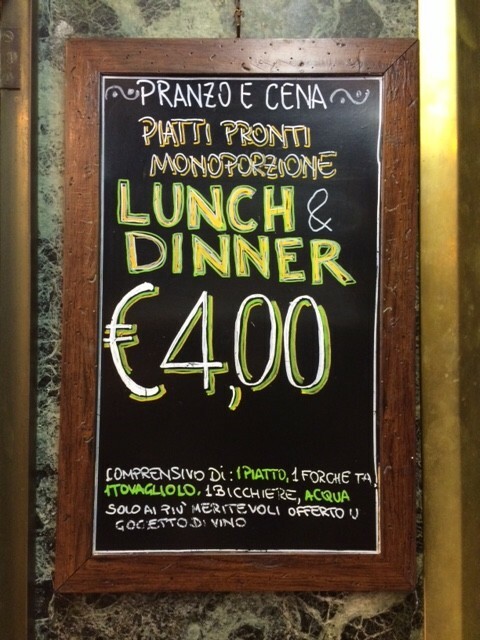 Update (2019) Pastificio now serves up 4 euro pasta dishes from 1 pm until 9:30 pm, making this the cheapest lunch AND dinner in the center of Rome. The meal still includes a small cup of wine and water (but now they keep the wine safely behind the counter). However, if you take the meal to go, you will not be given wine. If there is space, it is best to eat IN Pastificio because with laws now banning eating around monuments, it is hard to find any space near the Spanish Steps that is comfortable and allowed). Note that Pastificio still offers two daily choices, but this does not mean there is always a vegetarian friendly option. On my recent visit, one option had tuna and the other included speck (ham). That looks like a great place for lunch, altho I’d take mine out to the Spanish Steps to eat. And free wine? I’m in! YAY! I was looking for the name of this place lately. 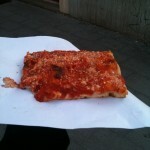 Do you have other cheap lunch/dinner suggestions for centro storico? One of my absolute favorite lunches in town! If you are lucky to go on a day they have the Carbonara, make sure and try it. It is one of the best in town. and of course, Thursday is Gnocchi day! Seems realy yammie, I have passed that place a lot of times but I have never stopped for lunch, I think now I will! I was so lucky to have discovered this place. It was recommended by Lonely Planet guidebook. 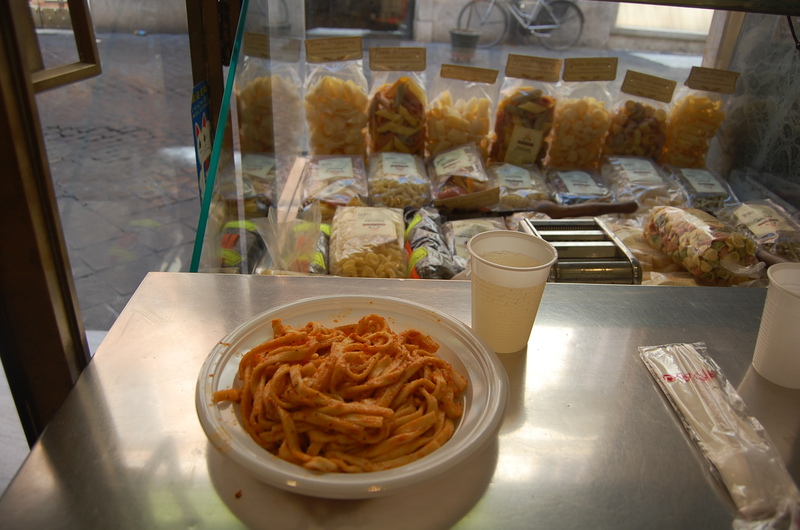 Amazing yet inexpensive pasta and very drinkable free water, plus warm and modest atmosphere! I thought they must be communist because other restaurants around were horrid and expensive! And I just wondered how do you say “this is to go” in Italian? At Pastificio they will put in a plastic to go container and a bag for you. 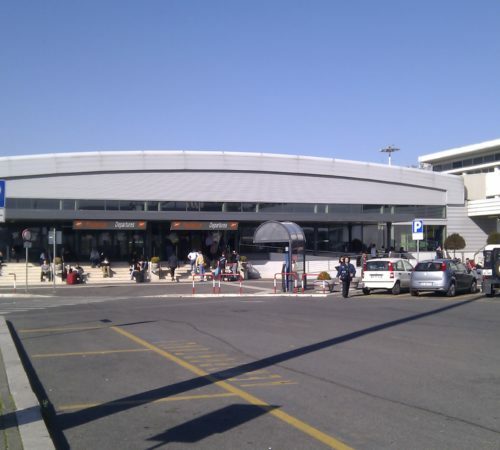 I live in Rome,I know ehere is it but I never got inside, next time I must stop for lunch. Um, can we please implement the complimentary house wine in America please? 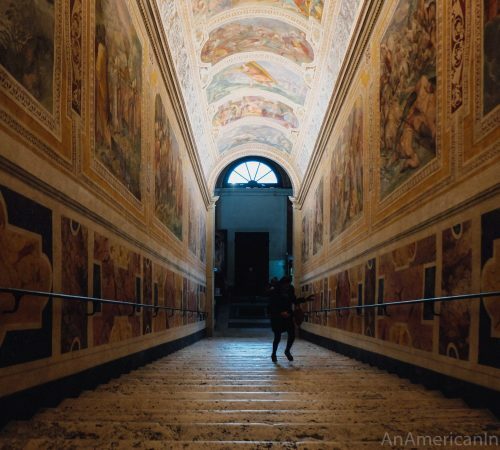 Pastificio holds a special place in our hearts like the rest of the eternal city!